​Tua Tagovailoa's meteoric rise from backup quarterback to Heisman favorite has been one of the compelling storylines of the college football. The superstar recruit with a Bible in his right hand and a football in his left has been tearing up the ​SEC at ​Alabama. 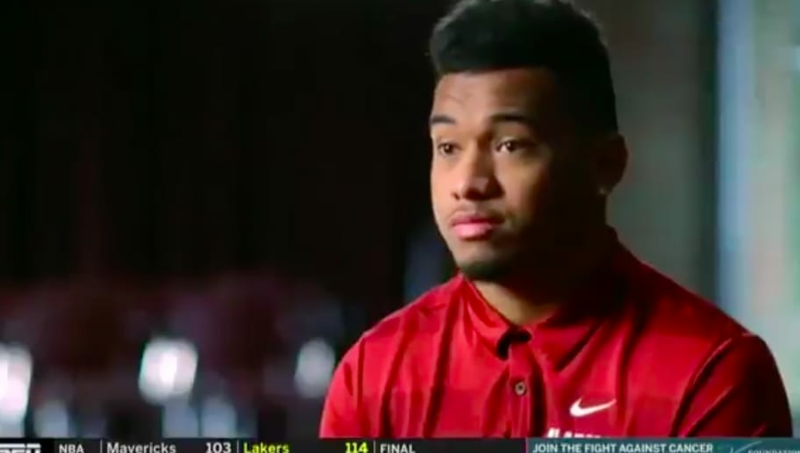 However, Tua's story took a turn for the strange and the harrowing after a segment on College Gameday went deep into Tua's family life formative years. In that interview, Tua claimed that his dad, Galu, would beat Tua with a belt if he played poorly in a game or got bad grades at school. ​​Tua, who throws left-handed, was forced to throw lefty even though he is naturally right-handed. His father is the only left-handed member of his family. His father also exerted control over where he and brother Taulia went to school. Tua is an incredible talent and somehow seems to have a good head on his shoulders, but that is the absolutely worst type of youth sports parent. ​​What's odd about this story is the fact that Tua is talking about this like it's so normal and ordinary. Even more disturbing is the fact that ESPN tried to make it seem like a motivating, heartwarming anecdote about his childhood. Was that GameDay story about Tua’s dad threatening to beat his son with a belt if he played bad supposed to be heartwarming? ​​Galu Tagovailoa appears to be the next in the line of excessively devoted sports parents living vicariously through their children. Todd Marinovich (another lefty star college QB) understands this perfectly.